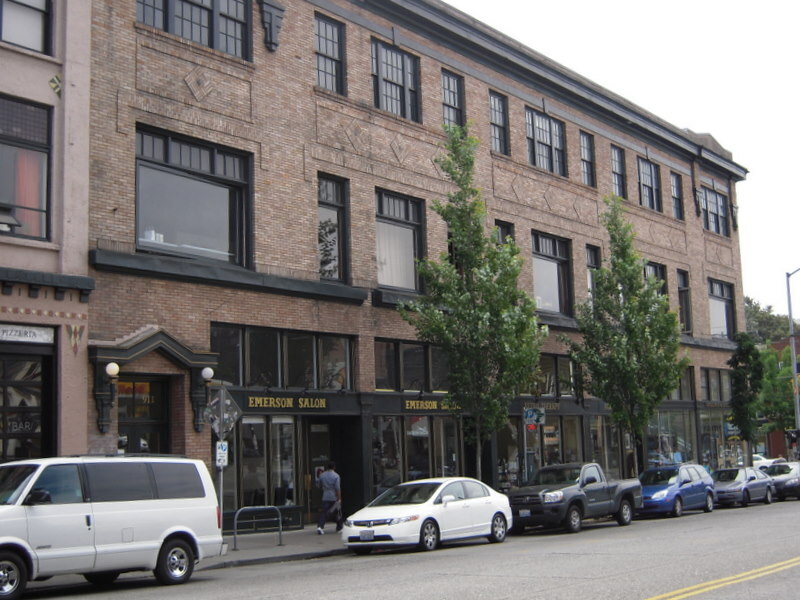 This is an early example of an urban auto dealership, with a show room on the ground floor and garage and offices above (901-911 E Pike St and 1534 Braoadway). It was built in 1912 for T. A. Davies, with an auto showroom on the first floor and garage above. The Pike/Pine/Broadway vicinity became Seattle's Auto Row shortly after the first automobile was offered for sale in 1905. For the next twenty years, virtually all the auto dealers, and numerous auto-related businesses, were located here. A unique building type was developed for auto dealerships. They were fireproof buildings or concrete or brick masonry, with showrooms with large display windows to show the merchandise, and driveways to provide auto storage in the rear and, sometimes, massive elevators to store autos on the upper floors. Some were highly ornamented with terra cotta. Others, like this one, had more simple but still striking detailing. This is a very good and intact example of the building type. In the 1930s this was the Tyson Oldsmobile Company, selling used cars. In 1948, it was the dealership for Tucker, an innovative post-war model that was sold for only a few years. Charles Haynes established a Seattle architectural office, Haynes and Cantin, in 1907, He remained in practice in Seattle and Aberdeen, with various partners, until his death in 1940. The nearby Butterworth Mortuary is probably his best known design, but he was also responsible for many revival style houses, commercial buildings and apartment buildings in the two cities. This large three-story brick masonry building is particularly notable for its intact windows and striking ornamentation. The ground floor has large display windows with large-pane transoms. The second-floor windows are large pivoting sash with multipane transoms; the top floor has six-over-six double-hung sash, in groups of three. The second-floor windows are unusually large, reflecting the influence of the Chicago style found in large commercial buildings early in the century. Gabled parapets mark each corner of the roofline, above a heavy metal cornice. Brick panels with large triangular medallions descend from the cornice at the corners and between the window bays. Belt courses run below the first floor windows and between the third-floor windows and the cornice, providing a horizontal emphasis and increasing the feeling of solidity. The storefronts are intact, although some of the display windows and transoms are newer replacements. The original garage entry under a gable at the south end of the west elevation has a newer door.